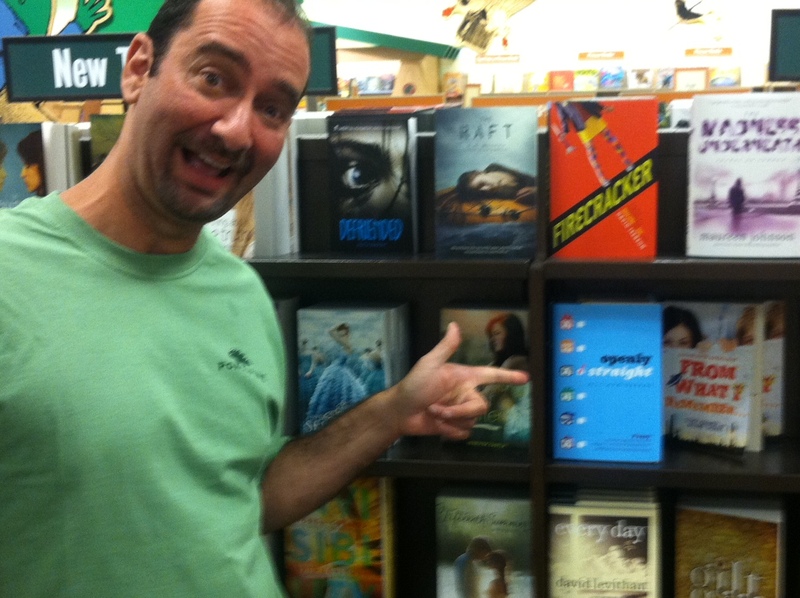 My dear friend and fellow author Lisa McMann took me to a Barnes and Noble in Gilbert, Arizona, on Friday night. I was surprised and happy to see that they had six copies of Openly Straight, so I did my cheesy, 70s pose in front of them. The folks at this Barnes and Noble couldn’t have been more gracious and kind, and I signed some books. Go to this store! It’s the one in San Tan Village. Lisa is awesome and a huge supporter, so I wasn’t that surprised when she started hand-selling my book. A mother and daughter (I think?) were checking out the teen book section, and Lisa said, “You need to read this book! This is the author, right here!” and handed them my book. Bless her heart. If you don’t have a friend like this, get a friend like this. The two females were very sweet, and we exchanged some nice words. After a while, the older one took the book and said, regarding Lisa’s initial question, “Well, that depends what it’s about.” She took a look at the back, read a few words, and said, “Nope, that’s not for us.” And she put the book back on the shelf. She wasn’t trying to be mean. And I didn’t take offense, per se. I mostly thought it was funny that she had labeled a book about labeling, I guess. It was like, that book is GAY. And we are NOT GAY. I guess, anyway. Who knows? Maybe she didn’t like books that are FUNNY and THOUGHTFUL, as those are two of the highlighted words on the blurbs on the back of the book. But it certainly highlighted an interesting issue: Openly Straight simply is a mainstream book. It has wide appeal. All sorts of people seem to like the main character, and they seem to laugh a lot, and they seem to relate in some way to his struggles. But it has a gay protagonist. Can a teen book with a gay protagonist break through the lavender glass ceiling? Will straight kids read a book with an LGBT lead? I want to point out that while this sounds like I’m talking about homophobia, it’s more subtle than that. It’s about the fact that like seems to read about like. I’ve spoken to friends about this. People have limited reading time. Given this, they are most likely going to read the types of books they are comfortable reading. The one teen novel with an LGBT protagonist that has made the New York Times Bestseller list is Will Grayson, Will Grayson, by John Green and my friend David Levithan. David is a rock star who sells a ton of books, and surely John Green’s name helped catapult this book; he currently has three of the Top 10 teen novels on that list. What keeps other LGBT titles from such wide readership? Or is this a fallacy? Do these books sell just as well as books without LGBT protagonists? I guess without access to Bookscan, I won’t know. This isn’t envy, I don’t think. It’s more … interest. I’ve been thrilled at the coverage Openly Straight has gotten; this weekend’s review in The New York Times has been a great opportunity for people to find the book, and from what I can tell, booksellers are certainly buying copies and in many cases handselling them to readers. I actually have no real idea about how the book will sell, and I’m trying my best not to make it my top focus. I just wonder. One of the themes of Openly Straight is the feeling, for some of us LGBT folks, that we’re being looked at through lavender-colored glasses. As it turns out in the book, sometimes people are NOT looking at us because we’re gay; they’re looking at us because we have tomato sauce on our chin. Do you think this is a case of life imitating art? Am I making this about gay issues when it isn’t? And if not, what will it take to get more non-LGBT readers to take a chance on these novels? You ask such fascinating questions in this post. Every time I sit down to write, I primarily consider the state of LGBTQ teen fiction, secondarily the state of African-American (or even brown-skinned) protagonists as featured–or not–in popular teen literature. I know firsthand it can be debilitating to think completely on homophobic or racist terms; truth is, there are wildly popular authors in both fields. David Levithan (as you mentioned), Malinda Lo, Sharon Draper, Walter Dean Myers. The list goes on. Not a single novel featuring a gay protagonist has ever won the Michael Printz Award (although this is the first year one–just one–has been listed as an Honor Book) although a few more featuring characters of color have won, including this year’s In Darkness. The fact that LGBTQ novels are still sanctioned off as LGBTQ novels in their promotion–thus how readers immediately perceive the book–inhibits readers outside the literary world from leaping aboard. Some of the most popular characters in all of YA fiction are Magnus Bane and Alec Lightwood, a couple readers prefer to see together than apart. Those characters make their debut appearance on movie screens across America this fall, thus heightening their exposure. Plus, the author has sold a series of books set in this same popular world featuring a gay character as the series’ protagonist. So… who knows? It’s a difficult topic of discussion that keeps my head spinning. Certainly something prominent on my mind as I hope to shape YA literature, in particular, with more diversified characters. Some great questions asked here!